Implantation practically means the insertion of an artificial tooth root to which an artificial tooth, called a crown, is attached later. 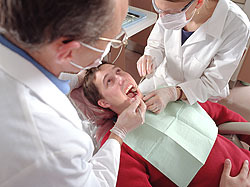 The procedure negates the need to damage (chisel) the neighbouring healthy teeth. Healing takes 3-6 months after the operation; for this period, the patient gets temporary fixed teeth that look just like the final product but cannot be used (loaded) as heavily. But in special cases, the final crown or bridge may be prepared immediately. It is naturally impossible to define the duration of the operation in advance, but generally, if no complication arises, one implant is inserted in just 5-7 minutes. If osteoplasty (bone grafting) is also necessary, then the required time increases to 25 minutes or thereabouts. In case more than one implant is inserted, four of them can normally be placed in one hour, including any bone grafting. The operation is entirely painless. After the implantation, the wound is closed with dissolvable suture, so our clients are spared the inconvenience of suture removal. The long-term crown is placed after the healing period. By that time, the gums have reached their final state, so a perfect dental prosthesis can be prepared. Unlike implants, crowns have a finite “life time”, but they need replacement after 10-15 years only. 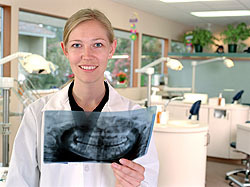 Before tooth insertion, radiography (x-ray or, if necessary, CT imaging) is performed. The operation is carried out in a sterile operating theatre, meeting the most stringent hygienic standards. If there is no inflammation or it can be fully eliminated, it is advisable to implant the prosthesis immediately after the extraction of the original tooth. In most cases, the implant is inserted in the place of the original tooth root. Once the mucous membrane is opened, usually all it takes is an “adjustment drilling” to bring the existing hole in line with the size of the implant. As we use dissolvable suture, the incision heals almost without a trace. The implant that will hold the temporary crown is screwed into the hole. The new tooth is ready for normal usage on the same day. A tooth may be extracted because of the atrophy of the bone in which it is embedded, due to which the tooth has become loose. In this case, bone is grafted (osteoplasty) at the time of tooth implantation. Tooth implantation is possible even if the bone tissue is porous. The mucous membrane is incised, and then a hole matching the implant is drilled. A second drill is used to adjust the diameter of the hole into which the implant is screwed. Then the incision is closed with dissolvable suture. If possible, a temporary crown is affixed to the implant, which can be used immediately after the operation, albeit to a limited extent. If you lose a tooth, try to have it replaced as soon as possible. 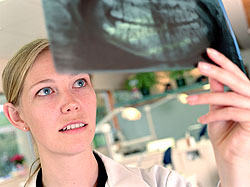 A tooth missing for a long time can cause several problems when you do finally decide for an implant. As time passes, atrophy of the bone in which the lost tooth was embedded starts. If there is no sufficient bone, no implant can be inserted. Nevertheless, even then there may be a solution: some very effective solutions are still available. 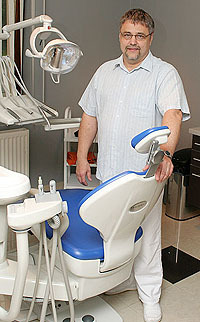 ►Who can get dental implants?